South Africa is one of the world’s top destinations for intrepid travellers to discover everything they’re looking for… and more. With over 21 National Parks, eight World Heritage Sites, 3,500 kilometres of pristine coastline, a phenomenal climate and awesome adventures ranging from shark-diving to surfing, historic trails to wine tasting and of course the Big 5 Safaris, South Africa is guaranteed to provide you with the unforgettable journey of a lifetime. Cape Town, one of the most beautiful cities in the world, is iconic – a city of breathtaking natural beauty, creative freedom of expression and change, a melting pot of cultures and a modern history reflected in its characters, architecture and stories . Famous for scenic beauty, Table Mountain, whale-watching, world-class shopping and a laid-back atmosphere, there are plenty of things to see and do in this fascinating city.Take a cable car ride up the world renowned Table Mountain and be inspired by the breath-taking views from the top. Head south along the scenic Chapman’s Peak drive and then on to Cape Point, part of the Table Mountain National Park and home to an abundance of flora and fauna. Make your next stop at Boulders Beach, Simon’s Town, home to one of the few land-based penguin colonies in the world. Not to be missed is Kirstenbosch National Botanical Garden, the first botanical garden in the world, ideal for picnics and there are several walking trails. And No trip to Cape Town is complete without a visit to our picturesque winelands. Choose one of the wine-producing areas and sample a mouth- watering selection of fine Cape wines, cheeses, chocolates and olives. Book your hostel in Cape Town with 6 HI Hostels to choice from. Read our customer reviews, view photographs and read detailed descriptions of all Cape Town hostels. Knysna is considered the Crown Jewel of the Garden Route. Known as South Africa’s Eden, the famous Garden Route provides an area rich in natural beauty and charm, attracting adventure-seekers and outdoor enthusiasts. Offering a wide variety of activities and attractions including the Knysna Elephant Park, Sunset Cruises, Forest Mountain Biking, Bungee Jumping, Golfing, Hiking and Bird Watching, Kyynsa has something to suit all.After a day of seeking adventure the African Jewel Lodge is the place to relax and unwind – a home away from home! Take in the fresh coastal air with a refreshing drink on the hostel porch overlooking the town of Knysna. With an African theme, including local African artwork, apparent throughout the hostel you will be sure to have a truly authentic African experience. For those with fun and sun on their minds, South Africa’s sunshine city has something for the whole family – golden beaches, surfing and a marine park. Bustling Durban is the hub of the province’s business and industry and pulses with all the energy of a major port city. With a Subtropical climate Durban is the perfect destination for a winter beach holiday. Book your hostels in Durban with 3 HI Hostels to choose from. 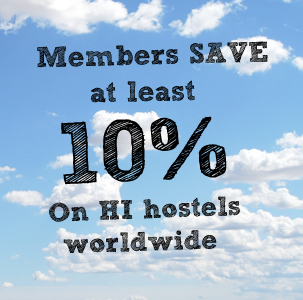 Experience new cultures, meet people of all nationalities and make lifelong friendships: the real hostel experience. Midway between Knysna and Durban, Chintsa serves as the southern gateway to the Wild Coast, famous for its unspoilt beaches, rich natural environment and rural lifestyle. Buccaneers Lodge & Backpackers is situated on the Chintsa beach and is set in wild coastal forest with exceptional sea and lagoon views. If you’re looking for adventure there’s a rural Mountain bike trail, beach horse rides, surf lessons and board hire, cultural tours to a nearby Xhosa village and guided trips around the nearby Inkwenkwezi Game Reserve. For a quieter time, canoe up the Chintsa River, visit the bird hide or take the two minute walk to the magical Chintsa Beach. Recently awarded the Fair Trade in Tourism South Africa (FTTSA) mark, Buccaneers Lodge & Backpackers is an experience not to miss. This world-renowned park of nearly 2 million hectares features 16 ecosystems. Old Vic Backpackers is a hostel in Nelspruit, the gateway to Kruger National Park. Surrounded by lush green hills and solid rolling rocks, Nelspruit is considered a shining diamond sparkling for all to discover. Awakening to a fresh new day let the guides of Kruger Flexi Tours proudly show you the incredible sights in and around Nelspruit from the amazing breathtaking views of God’s Window to the crystal waters of the Blyde River and the canyon. A stone’s throw from these attractions are beauties of a totally different kind – none other than the Big and Little Five that reside in Kruger National Park.To experience all that South Africa has to offer check out our full list of hostels in South Africa and make your hostel booking today!